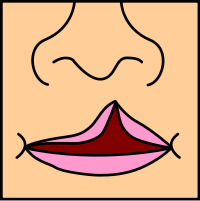 Cleft lip (cheiloschisis) and cleft palate (palatoschisis), which can also occur together as cleft lip and palate, are variations of a type of clefting congenital deformity caused by abnormal facial development during gestation. 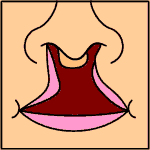 A cleft is a fissure or opening—a gap. It is the non-fusion of the body's natural structures that form before birth. Approximately 1 in 700 children born have a cleft lip and/or a cleft palate. 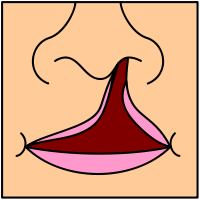 An older term is harelip, based on the similarity to the cleft in the lip of a hare. 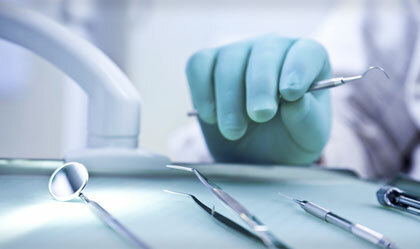 Clefts can also affect other parts of the face, such as the eyes, ears, nose, cheeks, and forehead.